Cops aren’t doctors, but they sure seem to deliver a lot of babies. 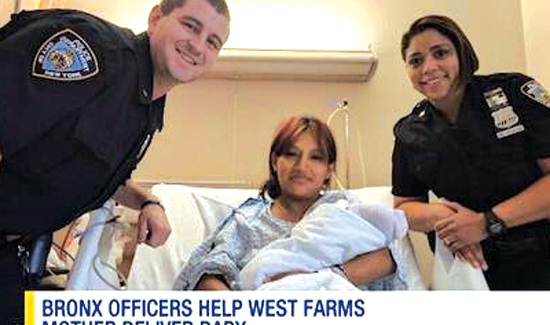 The latest story comes from the NYPD, where officers helped deliver two infants. NYPD Officer Doris Vega and her partner, Officer Timothy Canniff, responded to an early morning call from a Bronx apartment, where they found a 30-year-old woman in the midst of giving birth while standing up. Vega says she and her partner helped the woman get on to the floor, where they were able to assist her with delivering the babies. With EMTs on the phone providing support, the two cops did great. Mommy and baby were taken to the hospital and everything seemed A-OK. Turns out this wasn’t Vega’s first time at the baby rodeo. She also remembers helping deliver a baby some years ago, in another living room. She says she felt more confident this time because she’d done it before. “And it was a beautiful experience,” Vega said.